I've made my first batch of crumpets ever and I was most pleased with the results. I'm finding it hard to describe the Crumpet. Its a doughy, round and yeasty pancake; or soft spongy cake. Crumpets are traditionally cooked on a flat top griddle. The creamy batter is gently ladled into ring moulds, and whilst being slowly cooked the crumpets develop its distinct porous texture. For me watching these tiny bubbles appear and burst was quite amazing to witness. My mother has a fondness for crumpets. When I was a child, I remember her always bringing some home with her from her supermarket shop. I never quite understood her liking for them, as I found them bland, stodgy, bouncy and spongy. My mother would simply toast them under the griddle, spread them with a little butter and enjoy. I think I may have appreciated them more had they been pasted with something a little more exciting than just butter. Perhaps some berry jam, peanut butter, golden syrup, honey, even chocolate. Just imagine that melted chocolate being sucked up into those yeasty nooks and crannies. Well, I may not have had an appreciation for the crumpet then, but now I do. Forget about butter, chocolate and jam though. I enjoyed some this morning with Melon Chilli Jelly - how posh am I?! Well I have to start making a dent in all those homemade preserves, jams and jellies. Oh I don't want to mislead you, these crumpets do take a little while to make. First the batter, which you will have to rest for a few hours or so, and then the making/cooking of them is a slow, but rather calming process. I was in the kitchen a good hour, but I had nowhere to rush. Homemade Crumpets Makes 12 Ingredients 450g plain white flour 350ml warm milk 350ml warm water 5g powdered dried yeast 10g salt 1 tsp baking powder A little sunflower or vegetable oil Method In a bowl, whisk the flour, milk, water and yeast into a rather runny batter the consistency of single cream. Cover with cling-film and leave for an hour until really bubbly (or three to four hours, if need be). Heat a heavy-based frying pan or flat griddle over a medium-high heat. Whisk the salt and baking powder into the batter. Lightly grease the crumpet rings and pan. Put one ring in the pan, fill to just below the top – the batter should stay in the ring and lots of holes should appear on the surface after a minute or two. (According to Hugh, if it dribbles out underneath, it is too thin, so whisk a little more flour into your batter mix. If lots of holes don't form, it's too thick, so whisk in some water.) Assuming your test crumpet is OK, after five minutes or so, when the surface is just set, flip it over, ring and all. (If the cooked base seems too dark, turn down the heat.) Cook for two to three minutes, until golden on the other side. Repeat with the remaining batter in batches. Butter and eat at once, or cool on a wire rack for toasting later. Original recipe from the Guardian. 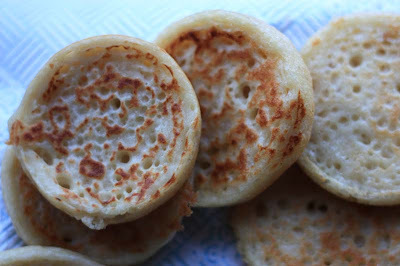 For a vegan version of crumpets, please check out Emma's adaptation on her blog Vegan Food for the Hungry Student. Crumpets and butter - delicious ! Are crumpets what Americans call English muffins?! I never actually new what crumpets were... everything makes sense now! I haven't had a proper crumpet for years and I used to wonder if I could make them myself but never had a recipe so now there's no excuse. Love them just toasted and served with butter nothing else needed in my book! Childhood memories! Oh my goodness, I can't wait to try these. I never had a really good recipe and only had them one time from a bakery. Thank you so much. Thank you so much Sally Kitten. I was pleased with them. Yes, Crumpets and butter go together, but you should know me a little by now - I like to be a little different - in a good way I hope! 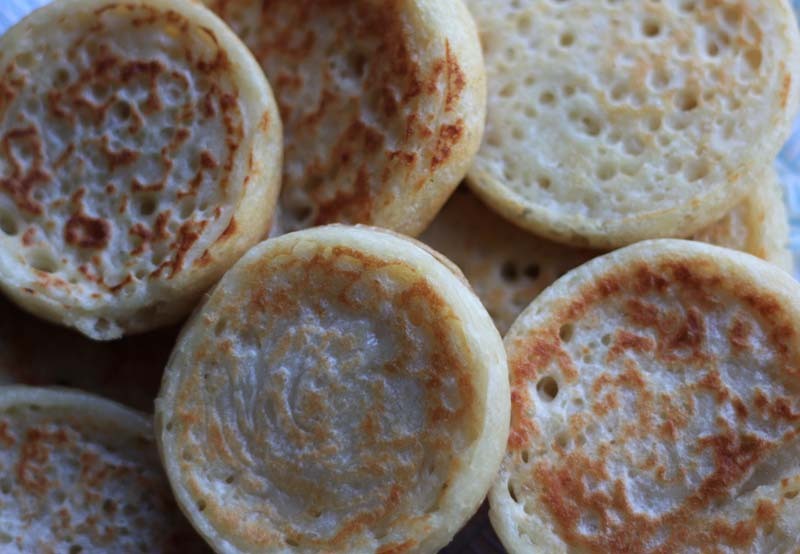 Crumpets look a little like English muffins, but they very different. Crumpets are much more doughy, chewy and spongy, plus they have lots of holes on the surface. A proper crumpet these were for sure. I'll be making these for my mother should she come and visit me. This is my first time making crumpets and I so recommend HFW recipe. Ah its okay, to have them just toasted and served with butter, I just like trying different combos. These do make a good batch. It should last a few good days. I am already thinking of how to eat them tomorrow for lunch. Thank you so much for choosing to become a follower too. It is very kind of you and most appreciated by me. I have never actually had crumpets, but have got recipes for it and have been wanting to try it. Looks lovely. Yum! Love everything yeasty really. Do hope you get to try your crumpet recipe soon. they look great, I like mine with some blueberries and butter. I still haven't tried doing crumpets. Seeing these ones makes me take one more step closer though. ...and Melon Chilli Jam, how good does that sound! Absolutely marvelous. I just LOVE crumpets and haven't had one in AGES. Never made my own. This is inspiring! One of my earliest memories is of my Mum trying to toast crumpets on an open fire, using a toasting-fork (an implement you could never get today!) - it wasn't very successful as I recall. When I eat crumpets I always want jam on them because I think they can be a bit dull otherwise, but they do make a convenient vehicle for picking up lashings of butter! This is such an exciting recipe! I've been wanting to make crumpets for ages! thanks! I am so pleased to make this Introduction for you. I must point out though, that home made crumpets taste compeltely different from shop bought ones. I like that you think that they are versatile, as I gave them savoury topping which I will be sharing later. It was a good change. I'm so pleased that me making crumpets has taken you a step closer to making them. Please do, they are so much more superior than shop bought ones. The Melon Chilli Jam was excellent, almonst honey like! Yes, i forgot to add 'with a crisp exterior' which you appreciate more when fresh! I must admit, I've never had cheese on crumpets. I will now be giving that a go, but before that I tried something different which i'll be sharing later. I hope you approve. I hope you'll make some of your own soon now! ~Thanks for sharing a memory from you childhood. I really did enjoy reading about your mother toasting crumpets on an open fire. Are those toasting-fork implements similar to what people use at capfires to toast marshmallows and sausages?! Or completely different?! You right, crumpets do need something with them as without a topping they are pretty dull. so to each his or her own I say, as long as they enjoy them. I must thank HFW for the excellent recipe! Plummy Mummy, I haven't tried the mango chutney option yet, will do when I make them again. PS Okay to use ready made mango chutney. I've never made it, my mother has and I remember it being a long drawn process. so I'm happyw ith shop bought too. I always wondered how the holes appeared in crumpets! Lovely to hear from you Nic. Oh you are a (kitchen) god! I have missed crumpets since I moved to Germany. Curiously I never thought of making them myself. This is a perfect recipe and with soymilk I can finally enjoy a vegan crumpet! We do drink soymilk, but I've not made it with soymilk. Hope you get round to making a vegan version.